Our story starts and ends with a drink. In the late 90s, Nikki picked up and moved out to Massachusetts, and keeping with her mid-western roots, she was looking to become a 'regular' at a local tavern. After a thorough search of breweries throughout western Massachusetts and southern Vermont, she settled on a nice little place nestled in the heart of Greenfield, MA known to the locals as The Pint, renowned for its artisan brews.Meanwhile, Dan was toiling away in the basement brewery of The People's Pint, crafting flavorful and creative British-style beers. He too was looking for that perfect pint, and with his background in food science, he figured he might as well do it himself. Dan and his business partner opened The People's Pint, a bar and 80-seat restaurant, in 1997 and served homemade beers, sodas, and a full menu that drew heavily on local produce and meats--back before the local food movement was even hip! Dan was the mastermind behind many of the beer and food recipes The Pint still uses today. So, every Friday night throughout the year 2000, Nikki would belly up to the bar and was served delicious ESB's and hoppy pale ales by a particular bartender with a twinkle in his eye. Their friendship grew, and the next thing everyone knew, it was pretty obvious Nikki had achieved her much desired regular status. Fast forward to the summer 2003, Nikki and Dan set off on their tandem bicycle to tour England. If you can believe it, they were still interested in this beer-thing; however, half way through the trip, Nikki was tired of flat ales and iceless gin and tonics, so she started drinking cider, omnipresent at each tavern across the U.K. In addition to draft ciders, there were distilleries and apple spirits, pubs dedicated entirely to cider, and a whole region of a country whose culture was built around the apple. Nikki and Dan made many a barn-stop, where people were making cider on his or her own; plywood signs invited locals (and the occasional crazy cyclist) to stop in for a homemade cider—they learned quickly to bring their own containers. Cider became a revelation on this journey, and little known to the riders at the time, this trip set the course for Tandem Ciders. With a little coercing, Nikki talked the New Englander Dan into moving to Michigan, where she had her heart set on living in Leelanau County. They noticed so many apples (along with a lot of cherries), but no cider in sight. After three years of planning, writing, thinking creatively, Tandem Ciders was born. From the design, to the building itself, they worked to build a place that reminded them of the many pubs from their English cycling tour: warm, fun, intimate--a place to stop, relax, and enjoy life for a moment. They also wanted the cidery to feel as though it was always part of Leelanau County, where neighbors and visitors would come for a pint, a taste, for the weekend, or each Friday night. 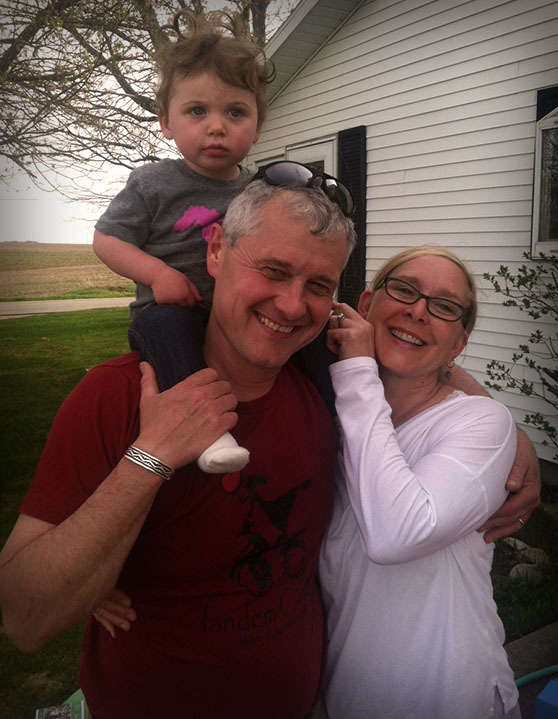 Nikki and Dan added Sadie B. to the Tandem team in 2012, and they are on the lookout for a bicycle built for three. There is rarely a time where you can’t find one of them behind the bar: Dan wiping down glasses, Nikki serving up a long list of ciders, or Sadie eating a handful of peanuts. Before we know it, Miss Sadie will be running the whole show, or if you have ever been there on a Friday night, you will see she already is! The Tandem Team also includes a wonderful group of dedicated, hard-working employees. Sarah Hoskins runs the tasting room, and our customers love to see her smiley face behind the bar filling growlers and glasses with her unflappable Sarah-flair. Richard Burton, cidermaker extraordinaire, has been with us since we were pressing on the small press, and he continues to expand his knowledge base and hone his cider making skills to churn out some delicious ciders. Although Tandem Ciders continues to grow and change, Nikki, Dan, and Sadie hope you will be right there with them. For regulars, who keep on coming round each night—we are always glad to see you. For newcomers, saddle up to the bar —make yourself at home. So, our story ends with a drink, come up to the County, stop by and have a cider And for those that have yet to visit—the Tandem crew can’t wait to meet you. We'd love to hear from you! Got a story? A question? Just want to talk? Great!